Learning the signs that someone might be suicidal, talking about problems (or anything) at Girls Night Out meetings, helping educate other teenagers about safety through the Students Against Destructive Decisions group, learning about mental illness, substance abuse, distracted driving, teen relationship violence. 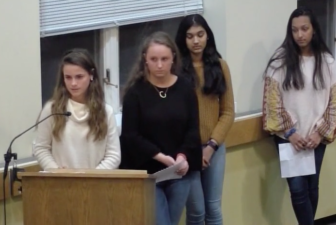 Those were the topics that nine Darien teenagers have been learning about at the Depot Youth Center, they told the Board of Selectmen at a recent meeting. During budget deliberations early this year, members of the Board of Selectmen said they thought it would be a good idea to hear more from the Depot and what services it provides to students. At the meeting on Monday, Nov. 26, Janice Marzano, the Depot’s executive director for programming, was present, but she let the girls speak for themselves. For some reason, every single one of the speakers were girls. One of the speakers said that about 10 freshmen are among the boys that have recently been showing up for Depot events. “At the Depot our mission is to unite the community through student-run events, as well as educate students and parents about common problems students and parents face in order to prepare them for college and early adulthood,” said Kaitlyn Olvany, a Darien High School junior. She’s been a member of the governing board since her freshman year and this year’ she’s vice president of community outreach. Kit Arrix, also a junior at DHS and a vice president for events, said she and Kaitlyn “work together to basically just plan events for the town, and get even the elementary kids involved, and the younger kids so the Depot becomes kind of the place they can go after school to do homework or, pretty much, hang with their friends. “This past year we have been educating our members on issues that are commonly overlooked in our school, such as depression, anxiety, addiction and the general safety of our students [involving problems] such as distracted driving,” Sage Gupta, a junior. With what they’ve learned, Gupta said, the group wants to keep the rest of the town informed. Rhea Bhat, a freshman member of SADD, talked about her own experience as a victim of a distracted driver (see separate article, here). From left: Emma Cavoli and Katie Elders. They told the selectmen about RespectWorks. “RespectWorks is a student driven group mentored by the Darien Domestic Abuse Council,” Cavoli said. Elders added, “Our goal is to bring more awareness to domestic violence, especially in teenage situations. “And to do so, we hold meetings with activities, such as guest speakers, informative movie documentary showings and brainstorm sessions about raising awareness for a cause,” Cavoli said. Police have come to meetings, talked to the group and given tremendous support to it, she said. 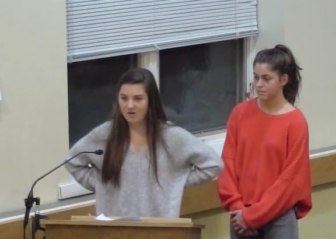 “Girls Night Out meets every other Monday for two hours,” Maggie Doran, a senior, told the board. “We sit; we have dinner — usually pizza — and we talk about anything and everything. Maggie Doran talked about Girls Night Out. “We talk about things from stress to — last week we had a speaker come in and talk about gender identity — to mental health and boys in school and parking tickets, and just everyday sort of things. Selectman Susan Marks asked how the selectmen might help the Depot. Sitting in on a meeting there “and just sharing your thoughts” would be helpful, Katie Elders said. Sage Gupta said that the students are trying to get school administrators to set a date for a safety fair later in the school year and asked for selectmen’s help. Stevenson said she’d pass on that concern to school district officials. Selectman Pamela Sparkman said selectmen could suggest to the Parks & Recreation Department that Depot members be allowed to set up an information table at some Park & Rec events. Students said they liked that idea. First Selectman Jayme Stevenson asked how the Depot compares with the high school in bringing up various topics. 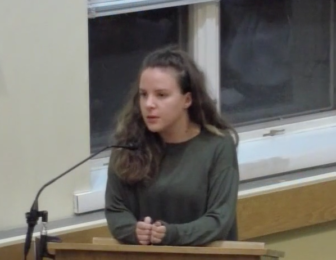 “I just want to get a sense of whether the schools are touching on these same topics, like suicide and mental health, domestic violence, etc.,” she said. 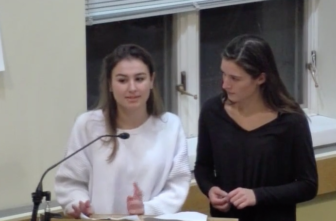 Board of Selectmen 11-26-18 from Darien TV79 on Vimeo.